Over the past two days, I’ve had the chance to learn how to wakesurf! Given some expert instruction and tons of assistance (i.e., holding the board steady for me initially, just like training wheels), I was able to stand up on a wakesurfer and ride the wake curl right behind the boat for a good 15 seconds! First we’d position the board behind the boat so that its front rested on the boarding platform and its tail hung out into the water. 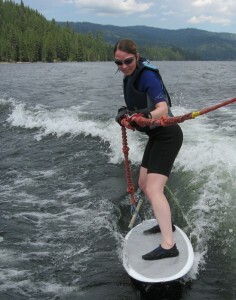 I learned to step onto the board with my front foot and lean my weight back out over the board, using the rope, without putting my back foot down until the boat picked up enough speed. It takes some practice to figure this out, but it seems to happen around 6 knots. At that point you can ease your weight fully onto the board (and off the platform) and slide backward, paying out rope gradually, until you’re in the wake curl. At first this felt really shaky to me, because your legs have to figure out how to absorb all of the little bumps and twists of the water while maintaining your balance. Then it started to smooth out, and I stayed up until the board shifted back a little, up onto the wake, and I lost my balance. Also, my posture in this picture could be improved by straightening my torso to make it easier to keep my weight centered over my feet and the board. But hey, not bad for ~8 attempts. The goal is to get enough control and comfort that you can actually let go of the rope entirely and just surf along behind the boat. I’m nowhere near that point, but considering that the last time I was really in the water was 1.5 years ago, and that was to learn (belatedly) to swim, I’m thrilled with what I was able to do today! I doubt I’ll ever be a surfer, and I also learned today that I have no innate waterskiing skill, but I’d definitely wakesurf again. It’s fun! 3 of 4 people learned something from this entry. Fascinating. I’ve had a fear of deep water my entire life, but this actually looks like it could be fun to me! Ha! My only exposure to wake surfing is from Wii Sports Resort, where it’s easy :) :). I did go waterskiing with a friend of mine in high school. I never really got to the point where I was able to stay up, but I had a fabulous time working on it. Wake surfing sounds very challenging! Great job, looks like you’re having a blast. Wish we could have been out there with you too. I knew this already only because I watched you do it! It was awesome watching someone with very little watersports experience master it so quickly. Oh, and don’t sell yourself short on the skiing front. You only tried it four times, and it looked like you were picking it up with average speed or so. A few more trials and you’d have it, I’m certain.